I put it on the Facebook post already, but I'm super geeked to play this and compare it to the compensating version. At this point I'll take "I don't know" as a valid response, but will the price range be similar for both? He had me at BAT!! Just curious if you ever considered putting the York style valve section and tuning wraps on it (obviously lengthened to BBb length)? And perhaps an 18 inch bell to thin out that sound a tad? Had a go on a Wessex Grand next to my Neo. Video below. I'm no Mr Olka, so please don't share, and it was more for me to hear side by side. It's not publicly listed. I recorded the audio as wav, no idea what YouTube will have done to it. (Sorry bloke!). Its a Zoom Q2n from about 15ft away (video zoomed in). Also not got to grips with the 5th valve, so didn't use it, apologies for some rogue low tuning. I'm more interested in the body to see what a compensator might end up sounding like if based on it. Special prize if anyone recognises the small excerpt at the end! Well Done AndyCat! I enjoyed listening to your playing. 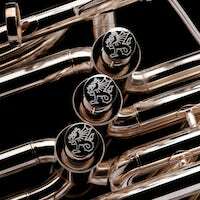 The two horns sound quite different to me in that the Wessex has a darker tone to it. Both very nice horns and I have been lucky enough to have a quick play of a Neo that lives in the same city as I do!.